Recent news events, including an anti-establishment surge in Italy, and President Trump's tariff tirade, underpin the argument for Mario Draghi to avoid any sudden moves in tomorrow's ECB statement and press conference. 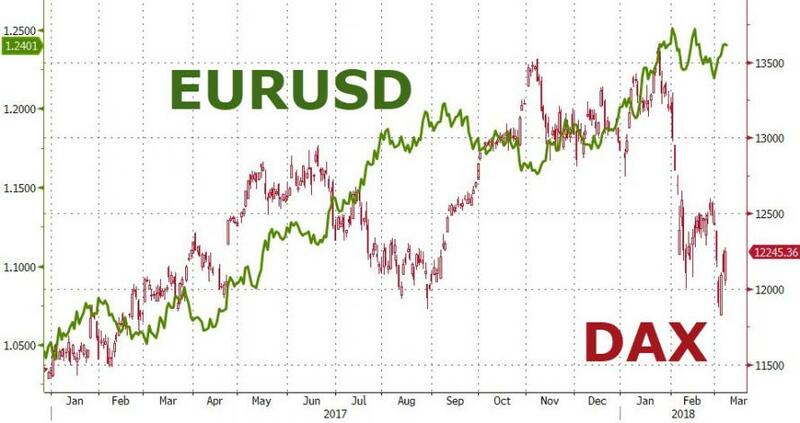 With the euro having traded somewhat sideways for a month as most of the European equity markets collapsed, analysts suggest that Draghi may take his currency-strength-jawboning foot off the pedal and tweak forward guidance estimates to signal the beginning of the end for easing. SocGen's Kit Juckes pointed out, "If we get a slight language tweak on Thursday and a drop in average hourly wage growth in the U.S., we’ll be above $1.25 by the weekend." As Ransquawk notes, last time round, the central bank refrained from providing much of a blueprint as to how they intend to unwind their current stimulus program after its current end-date of September with Draghi stating that no discussion took place with regards to tapering. When asked about EUR appreciation, Draghi stated that it was a source of uncertainty and it is too early to say whether FX moves have had a pass-through effect. ECB JANUARY MINUTES: The highlights from the January minutes saw policymakers state that changes in communications were viewed as premature with some expressing the preference for dropping their current easing bias. SOURCE REPORTS: In the immediate aftermath of the previous meeting, source reports revealed that ECB rate setters were split about the next move as the Euro’s rise complicates the outlook. Thereafter, further reports suggested that the Bank’s PSPP will conclude with a short taper and some officials want clearer guidance on interest rate hikes. However, the most pertinent of the sources for the March meeting came last week with ECB policymakers seen to be unlikely to signal a policy shift this time round but could discuss a dropping of their current easing bias. ECB RHETORIC: Perhaps the most significant recent contribution from ECB policymakers came from ECB’s Coeure who noted the ECB might end its net purchases even before it can see a sustained rise in inflation. However, this is likely to be more relevant for meetings later in the year than this time round. Elsewhere, Draghi highlighted last week that inflation is yet to show more convincing signs of sustained upward adjustment while the Euro area economy is expanding robustly. DATA: From a growth perspective, Q4 GDP figures printed at 0.6% and thus in-line with the Bank’s current forecasts. On the inflation front, prelim Eurozone CPI slipped to 1.2% from 1.3% during the month of February with core measures still uninspiring. However, prospects for wage growth will likely appease some policy makers. Elsewhere, survey data via Markit saw the EZ composite figure slip to 57.1 from Jan’s 58.8 but remains firm by historical standards nonetheless. RATES: No adjustment expected on this front until details of the curtailing of asset purchases have been announced later in the year. N.b., at the previous meeting Draghi stated that he sees "very little chance" that the ECB will raise interest rates this year. ASSET PURCHASES: As revealed by the latest ECB source reports, a discussion around dropping the easing bias for asset purchases is expected to take place. After the notion being rejected by policymakers in January on the basis that fundamentals had not changed enough to warrant such an adjustment, this meeting might be too soon for consensus at the Bank to adopt such a change in communication. Note, consensus before the source reports suggested that this will not be actioned by the bank until June with the Bank to not reveal their method of curtailing bond purchases until the following meeting in July. GROWTH: No adjustment expected on this front. INFLATION: No adjustment expected on this front. ECB STAFF PROJECTIONS: Changes are widely expected to be particularly minor/non-existent with information since the previous forecasts unlikely to provide much incentive for the Bank to make any major adjustments. From a growth perspective, Pictet suggest that there is some minor upside risk to the 2018 forecast but ultimately any changes are likely to be tweaks rather than the mass adjustments seen in December. On the inflation front, the firmer EUR is set to negate any upside pressure from the climb in oil prices and upside in food prices. However, BAML believe that 2018 inflation could see a minor nudge higher on the basis that the Dec projections were too soft at the time. See below for the December projections. PRESS CONFERENCE: Ultimately, aside from the macroeconomic projections and potential tweaks to the introductory statement, this week’s press conference could be one of the more uneventful presentations by the ECB President with Draghi set to ‘kick the can down the road’ on unveiling any major clues as to how and when the ECB will conclude their asset purchase programme. In terms of subjects the ECB President will likely be quizzed on by journalists, aside from the future path of the PSPP, Draghi will likely be questioned on the ECB’s view of ‘trade wars’ during the Q&A after the recently announced measures by US President Trump. This comes in the context of the ECB Jan minutes stating that "…the balance of risks to the global economic expansion was considered to remain tilted to the downside… uncertainty regarding the policy outlook in some major economies, including the risk of an increase in trade protectionism, continued to constitute downside risks.” However, as if often the case with Draghi it is likely that he will adopt a non-committal tone and state that the ECB are monitoring events abroad. As far as other political issues are concerned, Sunday’s inconclusive Italian election result will also likely be a talking point given the success of the populist ‘anti-Euro’ parties. However, both the Northern League and MS5 have scaled back their desire for a EUR-referendum with the leader of the former stating that a vote on the issue would be ‘unthinkable’. That’s not to say that both parties (should they obtain power) wouldn’t opt for reform of the Euro-area but it is unlikely to impact the ECB’s thought process at this stage with the matter currently more of an issue for domestic Italian assets. There’s also a possibility that Draghi will be asked about the Bank’s view on the EUR exchange rate given how much of a focus it was last time round. However, since then, the EUR has seen little deviation from Jan levels on a trade-weighted basis and as such, Draghi may opt to reiterate his previous stance of labelling it as “a source of uncertainty and it is too early to say whether FX moves have had a pass-through effect”.